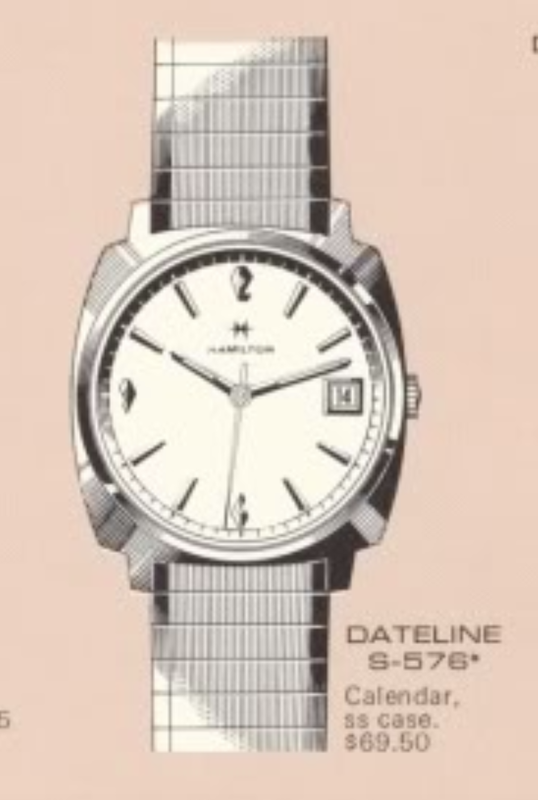 In my last post I talked about how Hamilton first introduced Swiss-made movements into their product line by using the Illinois brand. It wasn't long before they dropped the charade and introduced Hamilton-branded models with Swiss-made movements. If you want a Hamilton with an automatic movement or with a date complication there are plenty to be found but all of which will have Swiss-based calibers under the hood. For example, there's the 1968 Dateline S-576. It was produced through 1969 and is one of a handful of manual winding models with a date complication. The Dateline S-576 came in a one piece cushion-shaped stainless steel case. It has a reflector ring inside with chapter marks and a white dial with applied markers. Tucked inside is a manual winding Hamilton 674 movement, essentially the same as the automatic 694 movement but without the automatic framework attached to the back. I don't think you see this model particularly often so I jumped at the chance to purchase a fixer upper. As received, it looked pretty good, although it could stand to have a polish and a new crystal. The crystal wasn't even installed and all I had to do to open the watch was flip it over. Then the crystal and chapter ring dropped out. The 674 looks a lot like the 688 movement but it has all the date complication parts on the other side of the main plate. As you can see below, the watch is running and that's always a good sign that all that it needs is a good cleaning. This movement was very dirty and I was surprised by how dirty the cleaning solution got after the parts were cleaned. Everything looks nice a sparkling clean now. The reassembled movement is running with a good motion - off to the timer to see what it thinks. Wow... I wasn't expecting this... it's running a bit slow and has a large beat error. I wonder if someone monkeyed with it before I got it. That would explain why the crystal and chapter ring just fell out. If you look closely at the position of the regulator index relative to the silver hair spring stud, they are bit close to each other. The closer they are, the slower the watch will run. I can move the silver hair spring stud relative to the balance bridge to center the balance (and reduce the beat error) and then move the regulator index away from the hair spring stud to speed the beat rate up. There... that will do nicely... 12 seconds fast per day and a beat error of 0.5ms. You can see below I didn't have to move things too far. This is the sort of thing that can only be done with a timer - you can't make these adjustments with a stop watch. Once the dial is reinstalled I put the movement in the case and use the crown to set the time forward until the date changes - then I can set the hands at midnight. A new 30.6mm crystal should do nicely to seal the watch and improve the overall appearance too. A new strap, new crystal and fresh luminous paint on the hands make this 50 year old look like it just left the showroom. Not a bad looking watch, in my opinion.